What is scarier than seeing the insides of a human's, or in this case - human bones walking about? A bit freaky, yes. Well, on Halloween night, the image of skeletons and skulls are everywhere to be seen! 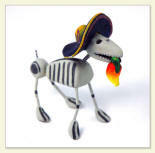 They can be seen as costumes, on decorations, greeting cards and on television. 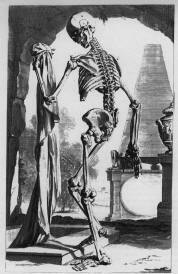 It doesn't seem difficult to understand how skeletons became associated with Halloween. Just like ghosts, the skeleton reminds us that Halloween was once a solemn day - a day for the dead. But in other cultures, to celebrate the dead is not morbid or sad. It is celebratory! On All Souls Day in Brittany, people go to the cemetery to pray for their ancestor's souls. There is a place called the place of bones where the remains of those long departed are kept together in one tomb. People come to visit this tomb - they walk along the entrance and touch the rows of skulls. They do this so they feel closer to their ancestors. 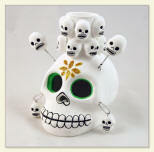 In Mexico, the Day of the Dead is almost like Christmas. Street peddlers sell holiday toys. 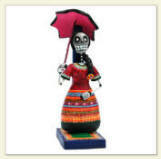 And these toys, seemingly morbid are actually colorful and fanciful. The skeletons have moving legs and painted in bright colors and many times dressed up like a Barbie. In America, it seems we have adopted the tradition of skeletons during our "Day of the Dead" - or Halloween, but it is less spiritual. Nonetheless, it is always in good fun. The Grim Reaper is the personification of death. He is often the shape of a skeleton wearing a black hooded gown, carrying a scythe. The scythe as Death's tool originates from a misunderstanding going back to the Hellenistic period when the god of harvest with his sickle, Chronos, was mistakenly related to time (chrono-) or Father Time. Now Chronus is seen with the scythe and he and the Grim Reaper frequently overlap. There are many explanations how the symbol of the Jolly Roger came to be. It is the traditional flag of European and American pirates with a skull over crossed bones on a black field. Some think that the skull and crossbones was an insult to the Vatican. Another theory is that roger came from rogue - a wandering vagabond. When a skeleton is wearing a top hat and donning a cane...we know where these skeletons come from. Aside from colorful teddy bears, the Grateful Dead's signature trademark skeletons make us wonder if it is indeed grateful to be dead. Formed in 1965 in acid-drenched San Francisco, the Grateful Dead, headed by Jerry Garcia, created eclectic music - rock, folk, blues and country. They still have a huge fan base - the Deadheads - that avidly follow them across the country hoping to..."ride that train, high on cocaine, Casey Jones is ready, watch your speed." Garcia even inspired Ben & Jerry's most popular ice-cream flavor: Cherry Garcia.